The 5 Watt 12 Volt solar crystalline module delivers top-quality performance for a variety of photovoltaic applications including remote electrification, water pumping, telemetry and RV/boat off-grid battery charging. 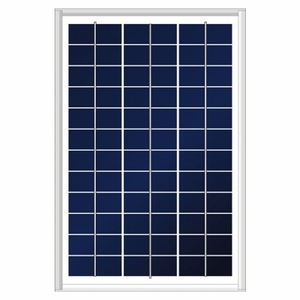 Consist of 36 solar cells connected in series providing optimum battery charging power. Impact resistant tempered glass surface allows maximum light transmission. Robust anodized lightweight aluminum tubular frames include mounting holes for quick installation. Weather resistant junction box contains bypass diode and is conduit ready. Engineered for rugged use to withstand hail, snow and ice.